French jeweler Mauboussin will launch Promise Me, a new perfume for women. The bottle design incorporates elements from the brand's Le Premier Jour jewelry. Promise Me a new fragrance which promises eternal love for today's women, for those who know what they want and get it. Notes for the fruity chypre include mandarin, rose powder, cotton candy and patchouli. Mauboussin Promise Me will be available in 40 and 90 ml Eau de Parfum. Look for it in October. Will pass on the cotton candy Master Lock. 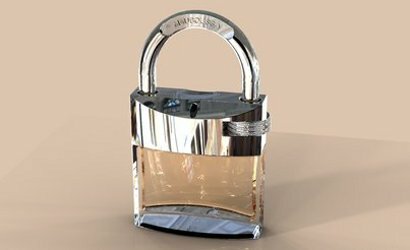 Didn’t Hermes do a series of padlock bottles? They appear to have been around since at least 2008. Nozknoz beat me to it, but yes. But not sure they’re the only ones…seems like I’ve seen at least one other. Brand won’t come to mind.